Hello, friends! I hope you’ve had a good week. I’m in between big projects right now, which always leaves me feeling a bit unsettled. We’re about to embark on a couple of large projects that will take a lot of my attention, and I always feel a little anxious at the start of these big endeavors. I’ll be glad to get started on them very soon! But before that, we have spring Oliver + S patterns to launch in just a week or two, and I need to design the next collection of Lisette patterns. Lots of fun! Yesterday we experienced quite a bit of excitement. Quick story: S and a few of her classmates are part of an after-school chorus at our neighborhood music school, and we parents take turns “car pooling” every week, meaning that we take turns picking up the girls from school and walking them to the music school a mile away. Yesterday it was my turn, and as our little cluster of walkers reached First Avenue at Seventh Street, just a few blocks away from our destination, we suddenly heard a huge explosion straight ahead of us. 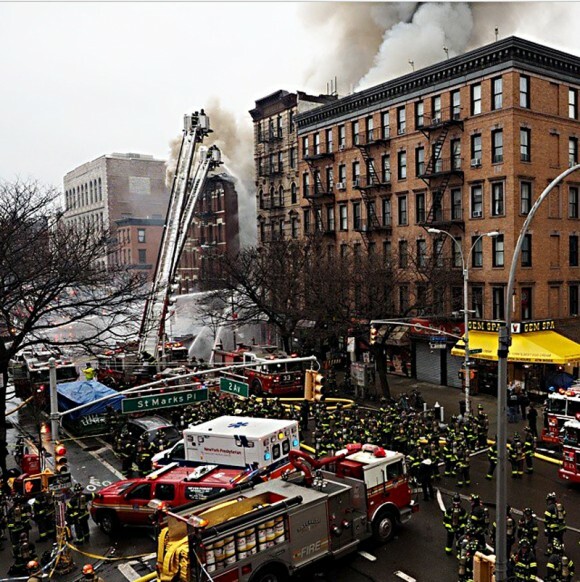 As it turns out, we were only one block away from the Second Avenue fire and building collapse. We were exiting the area as the police and fire fighters started to arrive. It was quite frightening for all of us; we could see the building with its missing facade and smoke pouring out, and as I frantically thought of ways to reassure the girls I remembered Mr. Rogers and his “look for the helpers” video. We talked about this for the remaining blocks of our walk: Mr. Rogers says that when tragedy strikes, look for the people who are helping and you’ll find hope. It worked. The presence of hundreds of New Yorkers and emergency workers was so reassuring, and I’m glad our girls are safe. There were some tearful reunions after chorus last evening. Whew! Anyway, I have lots of fun inspiration and reading for you this weekend! 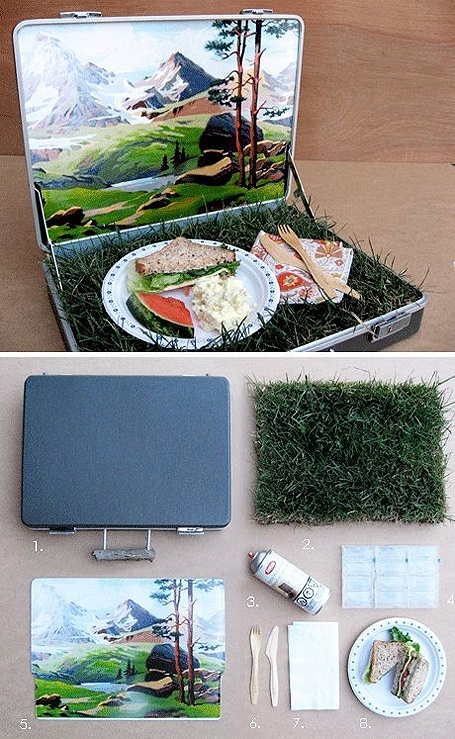 I showed this portable picnic case to S, and she really wants to make one next week during spring break. I think we may try it! Guess I’d better starting watching for discarded vintage briefcases and paint-by-number canvases. 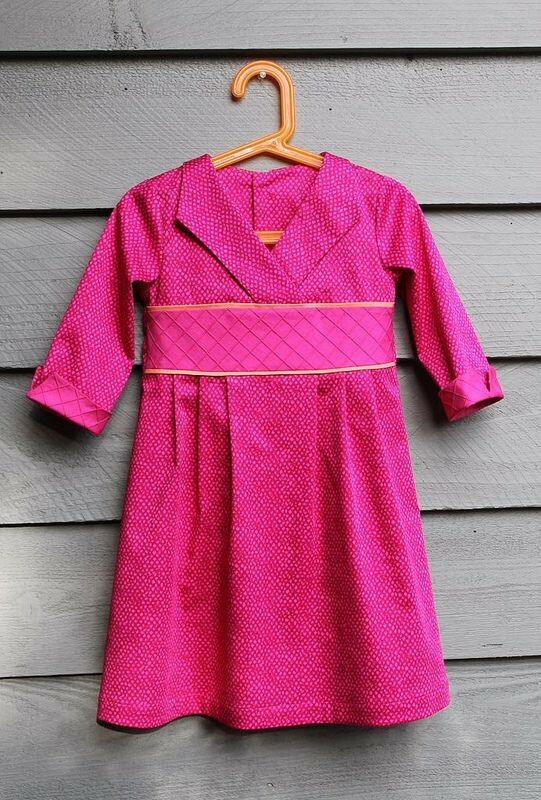 Such a sweet Library Dress! Marlene used the pintuck tutorial from Ashley and Emily (of Frances Suzanne) to add texture to the waistband. Aren’t the colors great? And speaking of colors, this palette is so peaceful and calm. 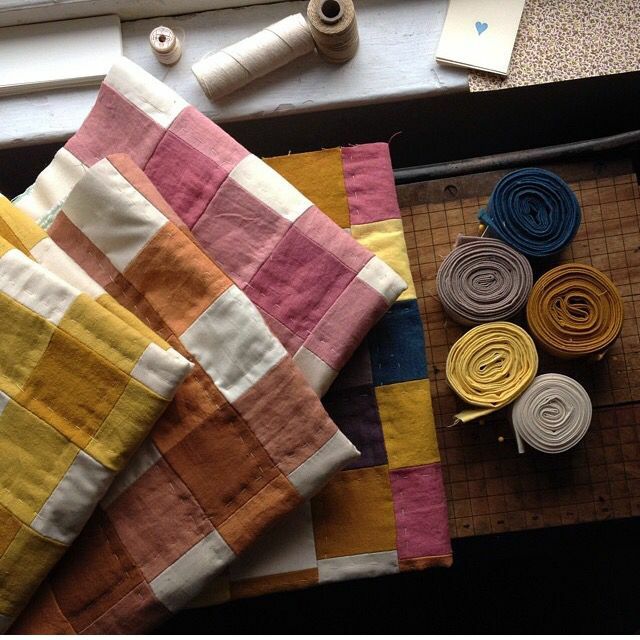 I adore the simplicity of this gingham-inspired patchwork. What is it about little girls and capes that’s so utterly irresistible? I think it might be the layers. In any case, this herringbone cape with bias-bound trim could inspire a lovely version of the Forest Path Cape for spring, couldn’t it? The tonal Puppet Show-style shorts underneath are awfully sweet, too. Today on the Lisette blog we’ll be finishing up our moto jackets. 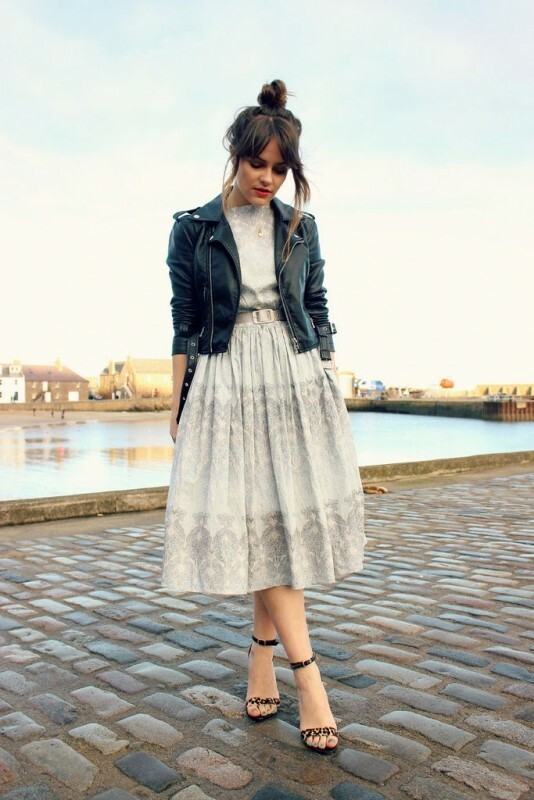 This outfit looks great, contrasting a tough leather moto with a sweet dress. Did you participate in the sew-along? If so, I hope you’ll post photos to the Lisette Flickr group! 1. I have a quirky confession to make: I un-follow every food-oriented Pinterest board that pops up in my feed (except for ice cream). I guess I just don’t like to look at photos of food. All the same, I’m completely fascinated by this video profiling the secrets of a food photographer. 2. It’s embarrassing to admit how very, very true this video is: Chloe Sevigny’s Guide to Being a New Yorker. I particularly love the part when she navigates around the giant slush puddle while swearing that she hates L.A. I wonder if we’ll get Todd back from his trip to San Diego this week or whether he’ll decide to stay until the weather here improves? 3. The crazy world of high-end children’s clothing. 5. My favorite trend forecaster, Li Edelkoort, recently published a manifesto on the death of fashion. And she made a lot of very valid points! It will be interesting to see whether her predictions prove to be correct in the years to come, that’s for sure. I hope you have a great and safe weekend, filled with warm weather and maybe even a little sewing time! Oooh, I love that little lunchbox! It looks like it might have come from Design*Sponge here (http://www.designspongeonline.com/2009/05/the-green-space-travel-case-goodbye-to-you.html) but I’m having trouble connecting to DS. When I saw the story about the building explosion last evening on the news, I wondered if it was near your home. I’m so glad to hear that you and S and her school friends are ok. Thanks for the interesting Friday article. I always enjoy them. I got it! The link was wrong. Here is the correct one: http://www.designsponge.com/2009/05/the-green-space-travel-case-goodbye-to-you.html. Oh, thanks so much! I’ll update the link. What a scary experience you had yesterday. I love suggestion from Mr. Rogers that you shared with the girls. I am excited to check out the food photography link you shared. So glad to hear you’re all ok. A friend-of-a-friend posted something very eloquent and touching about the calm assurance with which the FDNY went in and handled things. 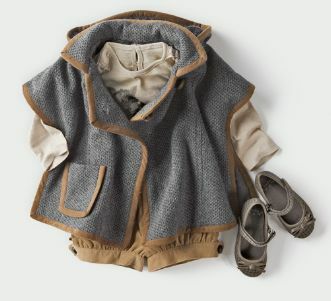 What an interesting article about children’s clothing — I’m constantly pinning outfits from Caramel. Funny about Bonpoint, I’m dying one of their white linen dresses right now. I didn’t realize it was that big a deal — the bodice isn’t even lined, though the linen is very nice quality and they gave the dress a nice deep hem. Some of our ladies on the boards sew better, frankly. I do love looking through their (and Jacadi’s) websites though, their looks are so wonderfully put together. I heard about this on the news. So glad you and the girls weren’t too caught up and that you are alright. I actually need to show my daughter the moto jacket so we can do a belated sew along for winter. so glad you all were safe and sound yesterday! what a scary thing to be so close to (in such a big city, no less)! hope you have a relaxing weekend. So scary, Liesl. I never heard of Mr. Rogers “look for the helpers” story. He’s right and I’ll be telling my kids about that.